Simon Onanguisse Kahquados (1851-1930) of Forest County, Wisconsin, the last hereditary chief of the Potowatomi. 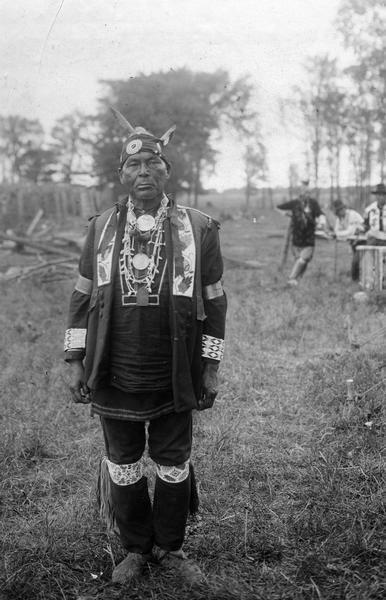 This image is part of an exhibit about Native Americans prepared by Paul Vanderbilt, the Wisconsin Historical Society's first curator of photography. Not all of our history includes fond memories. This week on a Northwoods Moment in History, Gary Entz reminds us of the way Native Americans were treated in the Great Lakes Region in the 19th century, and of a man named of Simon Kahquados. The Potawatomi have lived in the Great Lakes region for more than four centuries. The tribe originally held territory in Michigan but relocated to the Door County Peninsula in Wisconsin due to pressure from the Iroquois during the Beaver Wars of the 17th Century. The tribe expanded around Lake Michigan after 1800, but in Wisconsin much of the land the Potawatomi held overlapped with land the Menominee claimed. In 1831 the Menominee signed the Treaty of Washington that ceded 3 million acres to the federal government. Government officials wanted the Lake Michigan shoreline, but much of that land belonged to the Potawatomi. It didn’t matter as the federal government came in and took the land from the Potawatomi without compensation. This was the era of Indian Removal, and after the 1833 Treaty of Chicago many Potawatomi were forcibly removed west to Indian Territory. This is known in history as the “Potawatomi Trail of Death.” Nevertheless, a band of Potawatomi held on in Kewaunee County, Wisconsin, and it was at Black Earth Village that Simon Kahquados was born on May 18, 1851. Kahquados came from a distinguished lineage. One of his grandfathers is said to have been Onanguisse, the man credited with saving the life of early French explorer Robert La Salle when La Salle was starving in the woods. It was during Kahquados’ childhood, however, that the tribe lost its last holdings in Kewaunee County. Because the government considered the land ceded and not a reservation, a man named John Axtell took out a tax deed against the Potawatomi land and claimed ownership. The tribe was forced off the land in 1862 and became refugees. 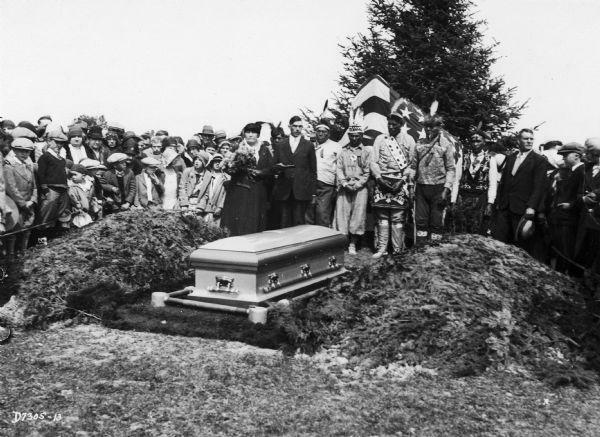 A group of people pose around the casket containing the body of Chief Simon Onanguisse Kahquados at Peninsula State Park during a reburial ceremony. Simon Kahquados and many others moved north. At the age of 18, Kahquados found work as a timber cruiser for a lumber company and later became a land surveyor. He was self-educated, taught himself how to read and write, and became a keeper of Potawatomi tribal history. His life’s goal, however, was to reclaim the Kewaunee County land the Potawatomi had lost. He made numerous trips to Washington to plead the tribe’s case, but with limited success. In 1913 federal compensation led to the purchase of reservation land in Forest County for the “Strolling Bands” of Potawatomi. The new reservation was due to the efforts of Kahquados and others like him. Despite a lifetime of service, Simon Kahquados was living on a government allowance of ten dollars a month when he died in a tar paper shack outside of Wabeno on Thanksgiving Day in 1930. As per his request and befitting his standing among the Potawatomi, Kahquados was buried near his ancestors in Peninsula State Park at the base of a memorial totem pole on Memorial Day 1931. This story was written by Gary Entz and produced for radio by Mackenzie Martin. Some music for this commentary came Podington Bear. The photos above are used with permisson from the Wisconsin Historical Society and can be found on their website here and here. This week on A Northwoods Moment in History, local historian Gary Entz tells us about a land dispute on Partridge Lake in the 1950s. Wisconsin First Nations have a rich history in the state, and this is particularly true in the Northwoods. There are many ways of looking at history, and understanding our past through the perspective of Native Americans is not only useful, it is necessary in order to have a complete record of the Northwoods story. This week on A Northwoods Moment in History, local historian Gary Entz explains the Treaty of St. Peters and how it affects us in the Northwoods today.